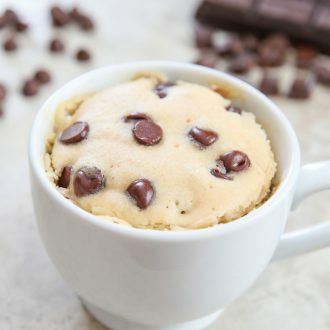 This single serving microwave chocolate chip mug cake starts with a fluffy brown sugar cake base mixed with chocolate chips. It cooks in just 1 minute and tastes like a chocolate chip cookie that got turned into a cake. Update! I’ve created a video to go along with this post, showing you just how easy this is to make! Do you ever have one of those days where it just isn’t your day? And you just want to hide in bed or sit in a dark corner and wait for the day to be over so nothing else goes wrong? I had one of those days yesterday. Then, while in a rush cooking a dish, I sliced my finger. It was at this point that I wanted to stop doing anything else and just wait for the day to be over. A few more things happened that I won’t get to into. But yeah, it was definitely not my day. And I kept thinking through the whole day that I really needed some comfort food, aka, this chocolate chip mug cake. This mug cake really hit the spot. It was warm, fluffy, and reminded me of my childhood. It’s a small, single serving cake, which is perfect since I would have consumed twice as much otherwise. And it comes together in about five minutes. 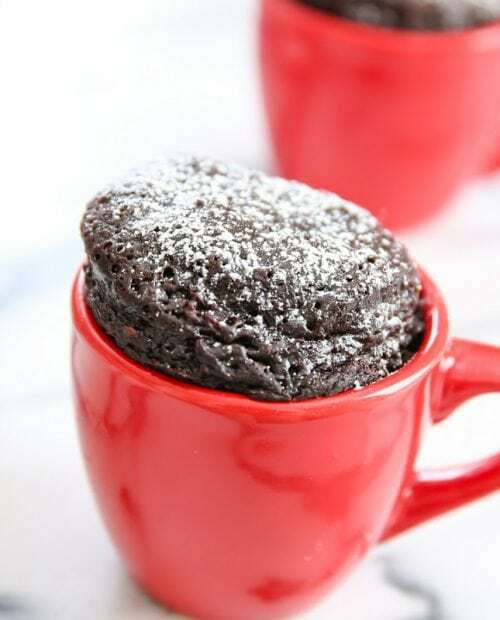 If you enjoy this mug cake, check out my mug cake category which has a ton of mug cake recipes. I also have an entire cookbook, 5-Minute Mug Cakes*, with nearly 100 recipes! 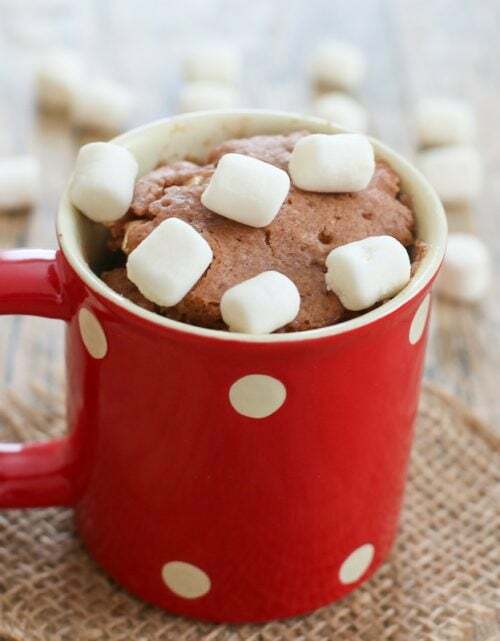 Combine all ingredients except chocolate chips into a microwave safe mug. This is a small cake so you can use an 8 oz mug and it should just reach the top when finished cooking. You can also use an oversized mug, but the cake will be lower in the mug. Mix with a small, sturdy whisk until a smooth batter forms and no lumps remain. Stir in half of the chocolate chips. Sprinkle remaining half over surface. Cook in microwave for about 1 minute. Let cool a few minutes before eating. 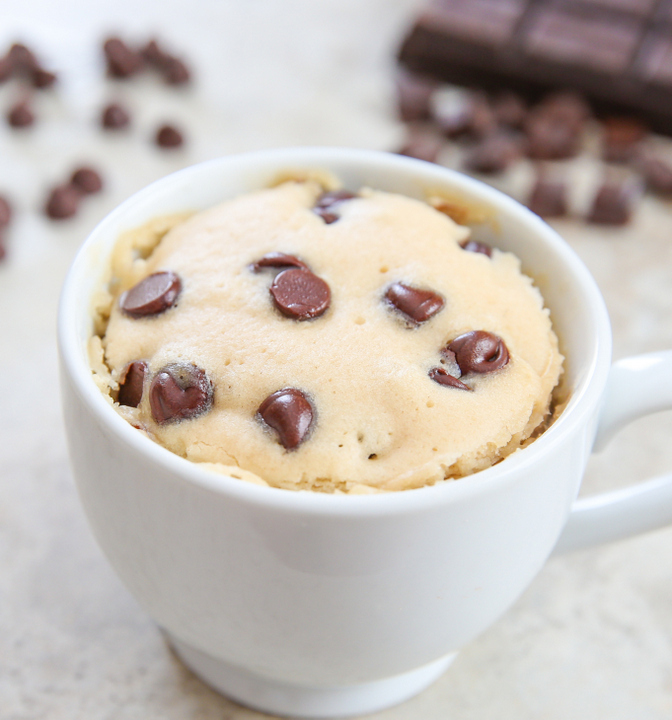 Check out my full mug cake recipe index! Hey! Just tried your recipe and loved it! thanks for giving me a new favorite recipe 🙂 I added a little bit of coffee powder in the batter and ate it with ice-cream and it tasted heavenly… Thanks again! Hey! Can I use normal caster sugar instead of brown sugar? Yum! I love this. It’s just enough chocolate, ooey gooey, and fluffy. Perfect! Thanks for sharing. sorry to hear that. did you do make any changes from the original recipe? It def shouldn’t take like veggie oil, esp since there is only a tiny bit of it used. I actually don’t recommend melting butter for these recipes. I’ve tried making them with melted butter and with vegetable oil and found that when it’s made with butter, it actually comes out a little dry. Perhaps, change the type od rhe veggie oil. Some veggie oils i find have a taste in it: peanut oil, canola oil. There are some neutral tasting choices such as sunflower oil or palm oil. Maybe your oil is rancid. I have tried many of these mug recipes and they are always too dry, not sweet enough and so on. This one is delicious. I made it with gluten free flour since we eat gluten free and it is the bomb. Thank you for the great recipe. I made this tonight, but added bananas and subbed coconut oil because that’s all I had on hand. It was fantastic! A little different texture with the bananas, though. awesome! yes banana def changes the texture but I’m glad you still loved it! I love it! But is it possible to bake it in the oven instead of the microwave? If so, for how long and how many celsius do you recomand? I’ve made this mug cake twice now, and I’m very happy with how it comes out. The first time, I realized after I’d already mixed everything else that I was out of chocolate chips. It was tasty, but not amazing. This last time, I only had whole milk, not lowfat milk. I’m not sure if it was this, or all the chocolate that made me like it so much more (or more likely, both) this time. it is def a bit plain without the chocolate. glad you like it! I just made this using coconut oil instead of butter and added chocolate chips. I didn’t have vanilla bean paste so just added an additional 1/2 tbs of vanilla and only 1/4 cup milk. Turned out delish! I don’t know if I did something wrong but my cake had came out a little bit too dry. Did you make any substitutions for ingredients? For example, milk? That’s something people often change around, which is fine, but I found certain milks like whole milk make the cake too dry. Also make sure you carefully measure out the ingredients. A little extra flour can make a huge difference in such a small cake. You might also want to lower the cooking time. Hope that helps! are you asking to refrigerate the batter or the finished cake? i don’t recommend refrigerating the cake for a few hours. it really should be eaten within an hour or so after it being made because it does start to dry out after. But I gave it a shot I think it was Carmel macchiato. It wS moist and I liked the flavor… We had nothing in the house for my sweet tooth and this hit the spot. yay!! haha, so happy to hear it worked with your husband’s creamer! Wow, so delicious and hits the sweet tooth spot! Even though I substituted almost half the ingredients with what I had on hand (coconut sugar, almond milk, coconut oil…vegan choc. chips), it still worked perfectly. Thanks for the recipe! wow, that’s so great to hear! I’m current eating this and couldn’t be more pleased! I added a pinch of coarse sea salt to the batter and I melted white and dark chocolate and drizzled it on top! Hits the spot. ???? that is so wonderful to hear!!! thank you for sharing your experience! I’ve made this mug cake twice now and it’s honestly one of my favorite desserts ever! Takes almost no time at all, has basic ingredients and tastes absolutely delicious! I’m sick at the moment and this was the perfect thing for me. I love that mug cakes are only one portion so I don’t have to spend all day baking 🙂 Thank you! OMG!!! I just made 4 of these 3 were doubled and one wasn’t. They were all delicious but I would recommend keeping the brown sugar the same and not doubling it. This is my new go to cake!! ???????????? yay! glad you liked it so much! My cake looked like rubber and tasted like it wasn’t ready after the first 1 min but I put it in longer after that and it still looked the same. Any suggestions? Hi, please try caloriecount or myfitnesspal. I do not provide nutritional information. thanks! How do you know if the cake is done because i did everything and microwaved it more 1 minute but it kinda looked like raw cookie dough still, is it supposed to look like that? Hmm, basically it should look similar to the one in the photo once it is done. When you say raw cookie dough, do you mean that it is still wet? Did you make any changes from the original recipe? I had a sweets craving, si I tried this receipe. It was delicious! This was very light and fluffy, I used coconut oil, and splenda, I was so surprised there was no egg used. I was good! ??? Possibly my favourite mugcake i’ve ever made, substituted liquid veg oil for margarine and it tasted exactly like cookie dough ! *That awkward moment when you think the writer is a boy but then you find out they’re a girl* Seriously though, your mug cakes give me life. haha, it’s ok! People make that mistake a lot! This was amazing! Not too dry. I cooked it for 1.5 minutes, but otherwise I followed the recepie. I will definitely be making this again! yay! thanks for letting me know your results! Looking forward to trying more of your mug cake recipes. so glad you enjoyed it! hope you’ll try the other ones too! Hi, I tried it too.. loved it to. . I use kinder joy mini chopped it.. did i say kinder joy. . Yes???? tthnxx for sharing???? Just tried the recipe and it tastes delicious! I am a vegan though, so I used almond milk instead of milk, and instead of 4 tbsp flour, I used 3tbsp whole wheat flour and 2tbsp oats. So good! Thank you so much! This turned out pretty good but I think I will add a pinch of salt next time to really bring out the flavours. Thanks! I absolutely loved this cake. I did however find it a bit dry. I used whole milk which may be the issue. Is there anything I could add to moisten the cake? whole milk is probably the issue. every time I use whole milk, the cake comes out a little dry. I think if you add a little water, it should help, but I haven’t tried it out. Oh my gosh was my reaction after the first bite. This is so incredibly good. I substituted Almond milk and peanut oil because they were what I had. Thank you for the best mug cake I’ve had. This cake was fantastic! My only suggestion would be to add some butter, since it was a tad dry. i’m glad you enjoyed it. I would recommend maybe adding a little more milk. I’ve tried the recipe with butter instead of vegetable oil and it actually gets a little dry. 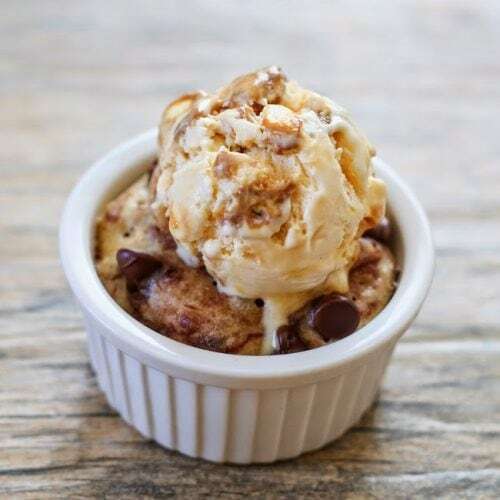 I’m on the hunt for THE chocolate chip cookie mug cake recipe. The last one was too sweet. Yours is really good, but just a little more flour-y tasting than I’d like. 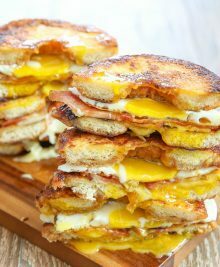 BUT it’s still delicious, and it made it on my Pinterest list! Thanks so much for sharing it. Yeah, I waited, but it was the longest two minutes of my life! 🙂 Keep making great recipes! I just made this and it’s the best mug cake I’ve made thus far! Used almond milk in place of cow’s milk and subbed coconut sugar for brown sugar. Hooray! 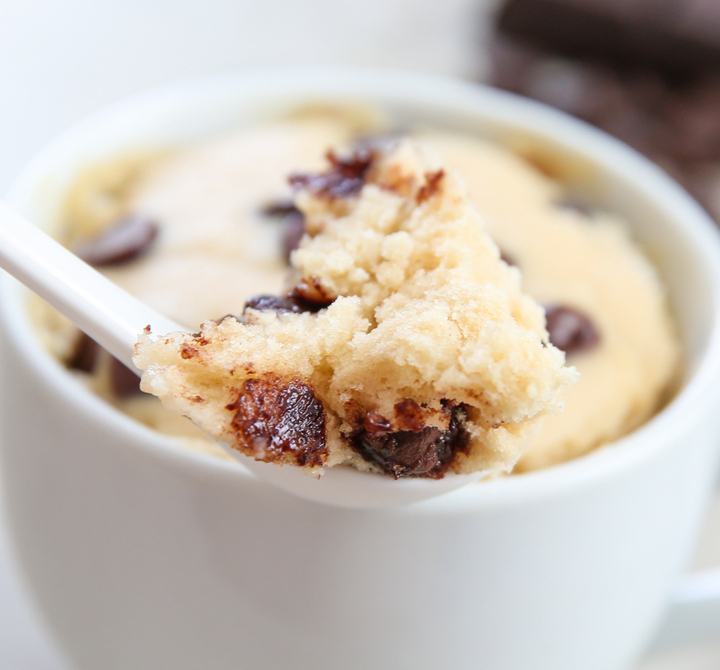 This is THE best mug cake recipe out there. ???? Thanks, Kirbie! wow, so glad you like it that much! thank you! 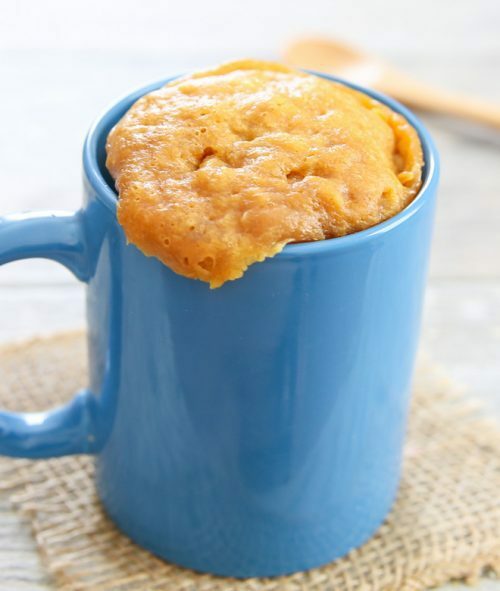 This is the best mug cake recipe i found but is it ok if i don’t use baking soda? Just made this and it turned out perfect! However, it tastes like it’s missing something… a pinch of salt, perhaps? Overall amazing! you could sprinkle a little sea salt on top maybe? Hmm, I haven’t had any issue with them burning before! I’m glad you got it to work though. You may also want to try just stirring the chips in so none of them are on the surface. 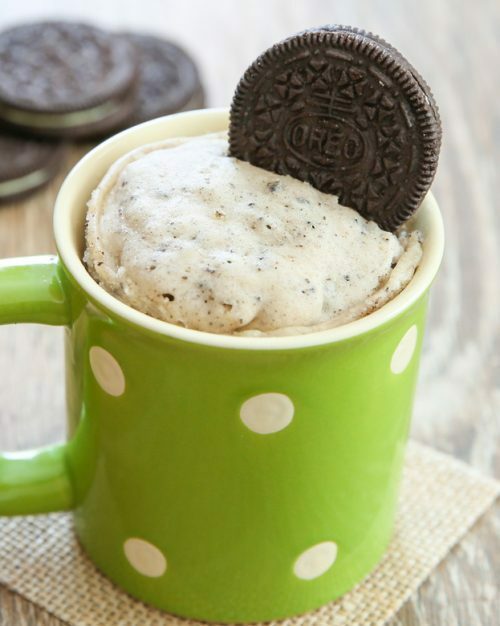 What’s the calorie count for this mug cake? Hi! This mug cake was absolutely delicious! Enjoyed every bite!???? thank you for commenting! I’m so glad you enjoyed it so much! that is so wonderful to hear! thank you for sharing! It was good. It def needed salt, maybe a 1/8 teaspoon. you can def adjust to your own palate! glad you enjoyed it though! Hey do you have any idea how many calories this would be? Thanks 🙂 it’s delicious! Sorry, I don’t have that information. There are many websites out there that provide recipe/ingredient analysis though so you could try entering the recipe into one of those sites. I ended up messing up the recipe a teen gbscause I read too fast (used butter than added veggie oil anyway) and used a teeny bit of regular sugar so although it tasted diff the basis was still good. I did this one before with the exact recipe and it was great ! Regardless great base thanks for the sunshine on this rainy day! I’m glad it was still good! 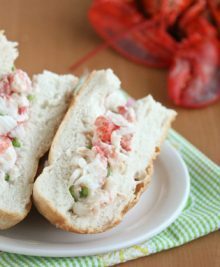 this recipe is a game changer! Chocolate cravings came on strong this evening, and rather than eating chocolate chips straight from the bag like a ravenous hormonal animal, I was able to sit down and enjoy a delicious confection. Super impressed with this mug marvel. I’m really happy you enjoyed this! Omg I just made it with my little sister and it worked! I used water instead of milk though but it was moist and tasted great! Thanks for the recipe! It tastes really good with Whipped cream and caramel sauce on top! Thanks for the great recipe. This was absolutely perfect! I literally just wanted like two chocolate chip cookies without all the mess and time it takes to make a whole batch. I am vegan and for some reason that usually means the most complicated recipes ever, but not yours! I used cashew milk, avocado oil and Enjoy Life vegan chocolate chips. It was delicious! Thank you! Tastes good. Daughter loves it. Had to cook a bit longer (30 secs) but good over all. I’m so glad you and your daughter enjoyed it! Thanks for this awesome recipe, tried it and tastes absolutely AMAZING. Hi Kirbie, Thanks for the great recipe and video! My husband and I both really enjoyed this! I look forward to trying some of your other recipes… Thanks again!!! I’m so glad you and your husband both enjoyed! Amazing flavor. Perfect combination of cakey and chewy. Almost wish that I hadn’t found it; I’ve made it twice in two days!!! I made this with almond milk, dairy free chocolate chips, and no oil. Turned out great! I didn’t have any vanilla so I made this with two tablespoon of milk then a tablespoon of French vanilla coffee creamer. And it came out amazing. I love your recipes and trust them 100% and this has been my go to dessert since this recipe came out its so good. Definitely will recommend you to my friends. Your my go to website for any meals. This is my number 1 favorite dessert. Thank you for sharing this with everyone. thank you for the kind words! So happy to hear this one is your favorite! This is probably one of the best things i have ever eaten in my life. It is so amazing and super easy to make. I absolutely love it! Thank you for sharing this!! so glad I found this recipe, just gave it a try and it was so easy! Perfect for when you crave something sweet but don’t want to make an entire cake.